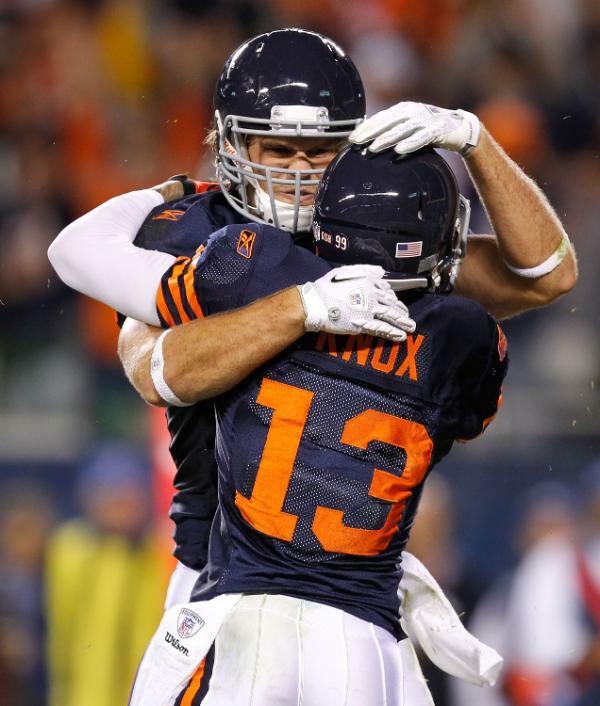 Denver Broncos: Since Denver started this trend, 44th & Goal will start with the Broncos. The Broncos used to have pretty pedestrian uniforms, with only the colors helping the Broncos stand out in the NFL landscape. Enter Nike. The athletic wear company reinvented the team's image preceding the 1997 season and the rest is history. The current Broncos design relies on a vertical stripe motif with sharp curves on the ends. 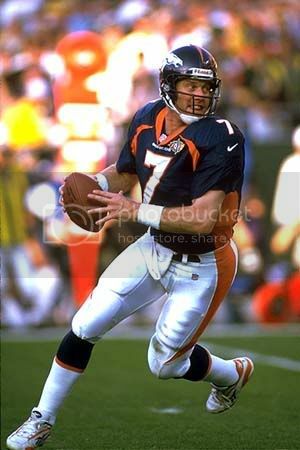 The home uniforms were originally supposed to feature navy pants, but those were relegated to alternate status at the behest of some of the team's veterans, such as John Elway. 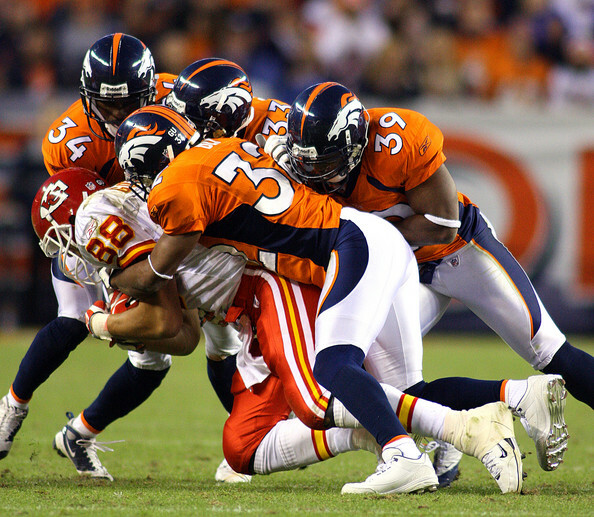 The Broncos certainly enjoyed on-field success in the new threads, winning two Super Bowls directly after adopting the new uniforms. 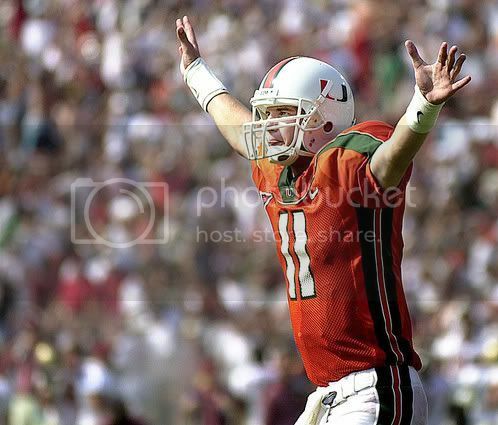 Design-wise, the uniforms were an instant classic and remain a classic to this day. The one flaw within the set is the lack of interchangeability, but that's a minor quibble. New England Patriots: Three years later, the New England Patriots would become the next team in the side panel craze, along with the St. Louis Rams (more on them later). 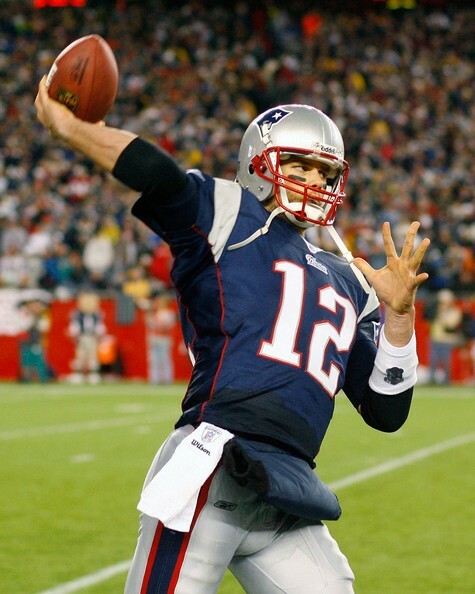 New England's design consistenly uses a navy side panel outlined in red piping on the jerseys and silver pants, with an extra white outline flanking the red on the team's navy pants. Although the extra white outline inhibits the team from going all-navy, and sometimes the striping doesn't line up, the overall look is pretty well-executed. 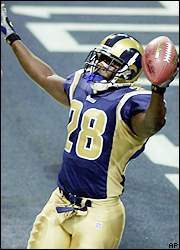 St. Louis Rams: The Rams are the one-hit wonder of the side panel craze. 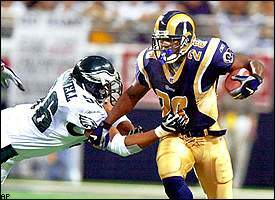 The season after winning the Super Bowl, the Rams played in these uniforms. I guess after watching the team try out the side panels for a couple years, the team's brass thought said panels were superfluous, since the team wore a modified version of the uniform two seasons later. 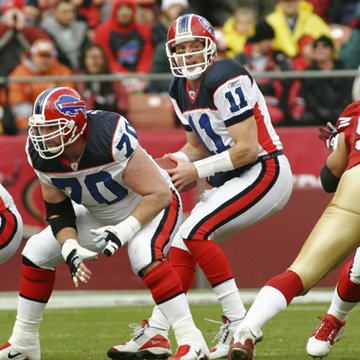 Buffalo Bills: Buffalo, New York is home to the NFL's ugliest uniforms ( and I am not alone in that opinion) and the team that plays in them. 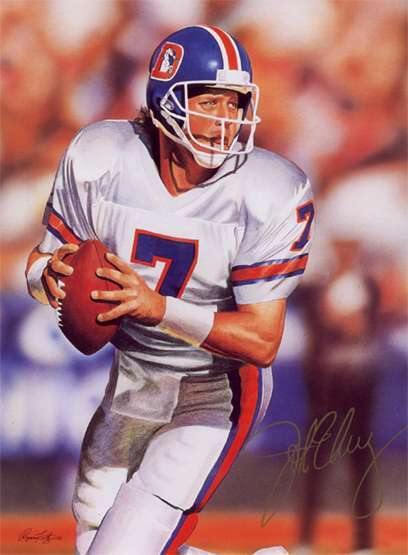 Before the current incarnation, the Bills donned their Jim-Kelly-four-Super-Bowl-losses uniforms. And those uniforms weren't anything special, either, as the jerseys were almost exactly the same as the Giants' jerseys of the Phil Simms era. (The only true differences are the number font, and the fact that the Bills' striping uses a thicker white stripe with thinner red stripes on the sleeves.) 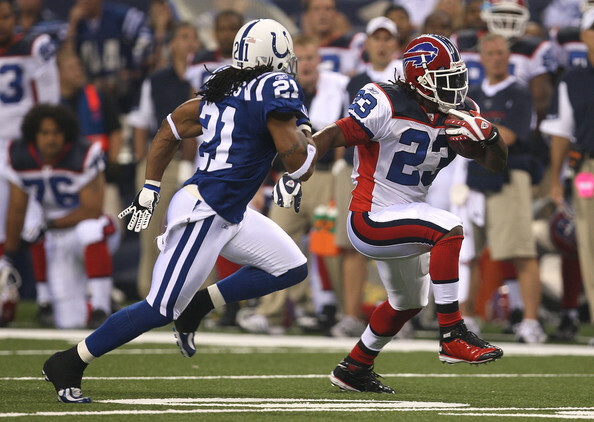 Further back, the Bills wore the jersey they currently use as an alternate, which would not be advised as a full-time uniform since the stripes almost don't fit on the sleeves. But back to the current duds: The side panels on the jerseys are solid red, to mimic the streak on the logo. The pants, however, add to the red stripe, with navy flanking the red on the white pants, and nickel and white flanking the red on the navy pants. This is because the uniforms were originally supposed to be paired as such: navy jersey/white pants and white jersey/navy pants. The team is currently wearing either all-navy or all-white, making the side panels clash with the pant striping. Between this oversight and the guerish rectangular shoulder yokes (more visible on the away jerseys), the Bills have yet to perfect the art of side panels. 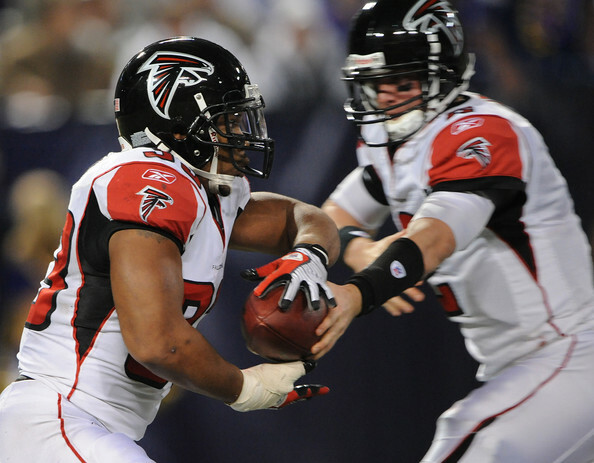 Atlanta Falcons: The Falcons adopted their current uniform design preceding the 2003 season. 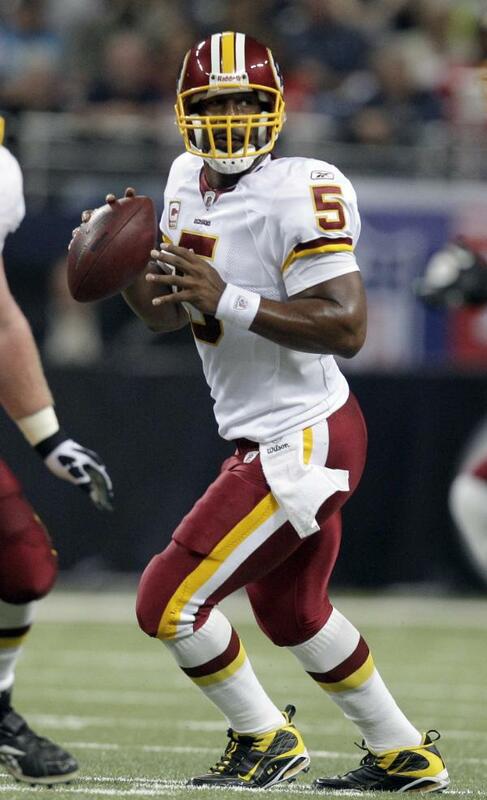 While the previous uniforms were pretty pedestrian, the current uniforms are not. 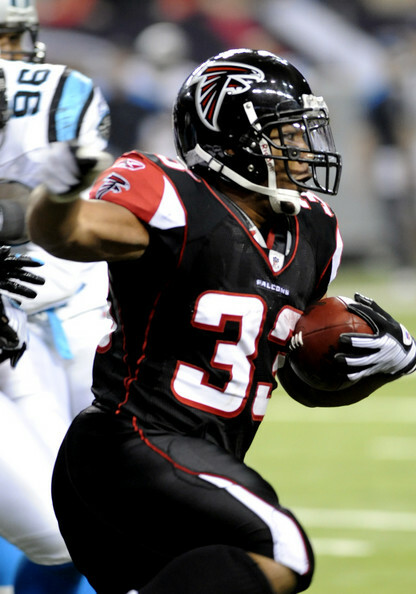 Although the Falcons' threads do not use a "traditional" (and I use that term loosely) side panel, they do use a "side piping" style in which a single strip of piping runs down the side of the jersey and continues down the pants. As far as side panels go, this use of jersey space is one of the better options. The simple piping stays consistent between the jerseys and pants and manages to stay fairly lined up, even as players' bodies are turning. Cincinnati Bengals: The Bengals have, perhaps, the most unnecessary use of side panels in the NFL. Their uniforms feature tiger-striped sleeves and tiger-striping down the sides of the pant legs. But the home and alternate jerseys also have solid white side-panels. 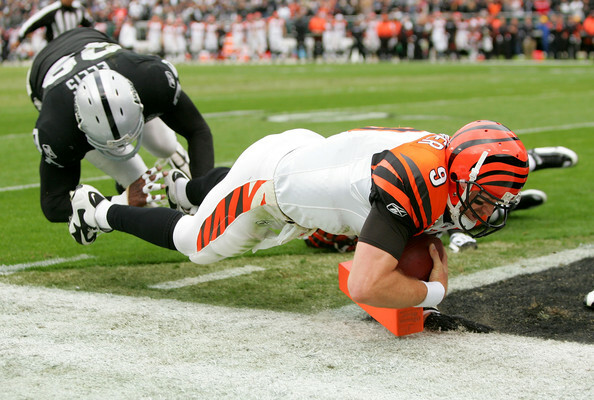 The Bengals apparently thought the white side panels were necessary to justify the pant stripes, but all they really do is clutter the design. Like the away jersey, the home and alternate jerseys would look better without the side panels, although the black pants would need to be edited. 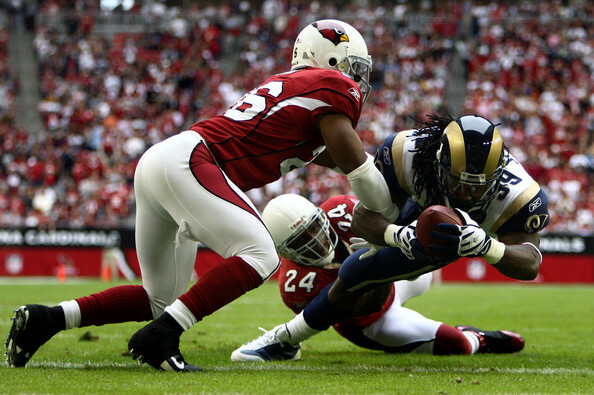 Arizona Cardinals: The Cardinals use their side panels in a consistent fashion between the home and away uniforms (cardinal red panels with black piping), as both jerseys are paired with white pants. But things weren't always like that in the desert. The Cardinals used to have a pair of red pants in addition to the white set. The red pants, however, looked weird because the white section terminated in an odd way. 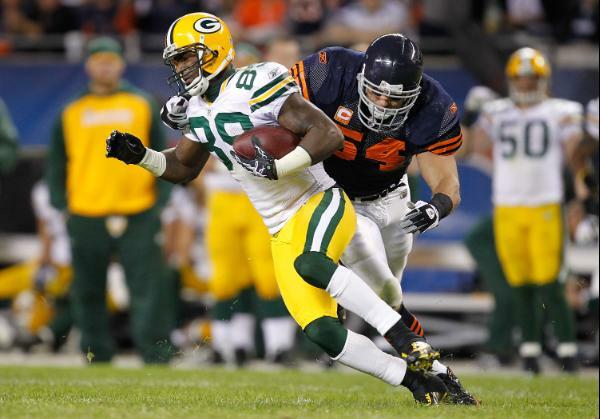 Luckily, the team removed the red pant option following the 2007 season. But if you think Arizona is a one-pant-design team, you'd be mistaken. The team recently added a second pair of white pants to pair with their new black jerseys. 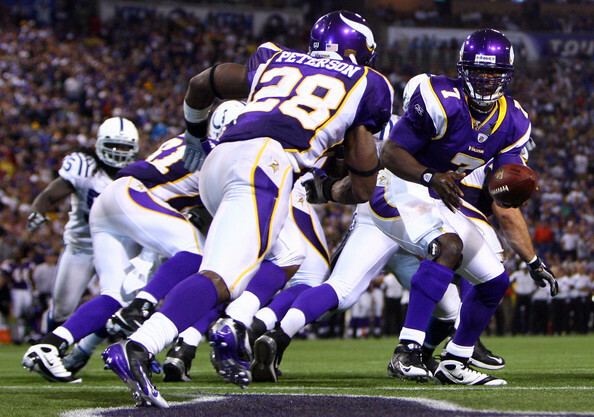 Minnesota Vikings: The Vikings redesigned their uniforms for the 2006 season, but pigeonholed themselves combo-wise. While the jerseys contain solid side panels, the pant stripes switch colors just below the hip, leading the uniform to only look correct if the jersey is worn with contrasting-colored pants (not that correct means good). The arbitrary color switch looks like an afterthought, whether the team goes purple jersey/white pants or white jersey/purple pants. I know what you're thinking: Don't the Vikings wear white pants on the road? Yes, they do, and the arbitrary color change on the pants looks even worse in that configuration, not to mention the ridiculousness of the side panels on the all-purple look. If only they went the Falcons' route and kept the side design to simple piping. 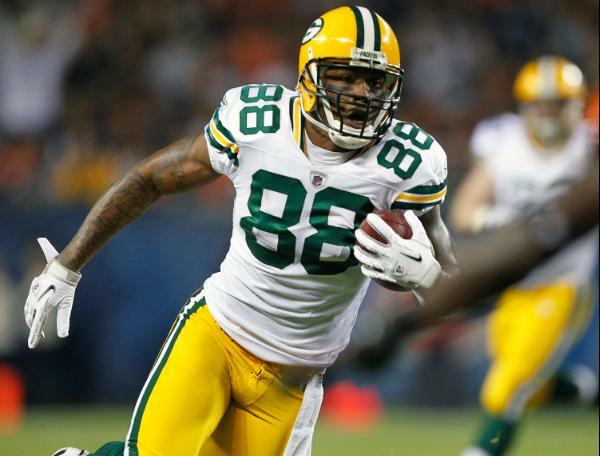 The use of side panels on NFL uniforms in the context of a design element certainly has its place, but uniform designers need to think about all the possible ways a team will mix-and-match uniform elements. The Broncos, Patriots, and Cardinals did so by limiting combinations, while the Bengals and Falcons tried to apply a mix-and-match philosophy, but the Bills and Vikings utterly failed. 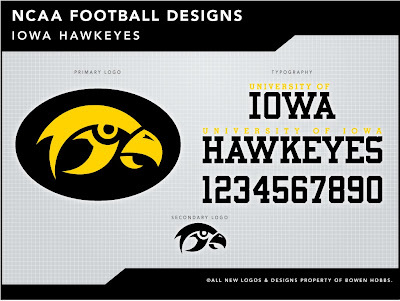 This week's design section comes to you with a new name and a re-brand for the Iowa Hawkeyes. The Hawkeyes' current logo was designed in 1979 and hasn't changed since. 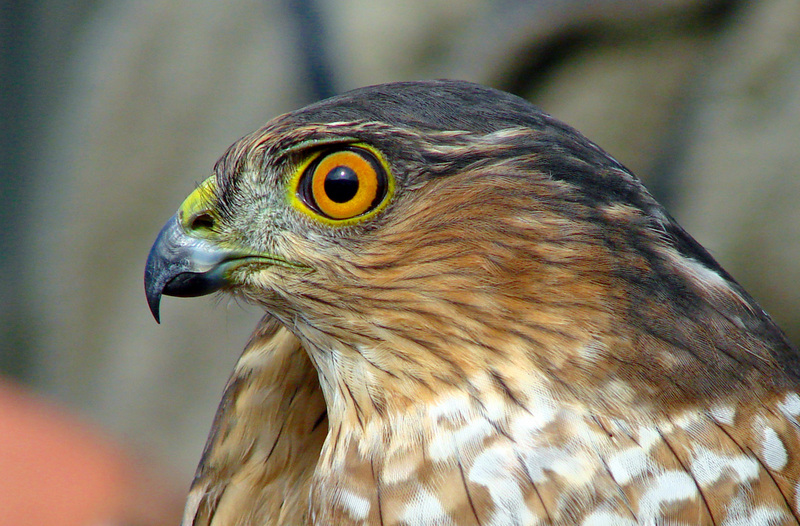 The main issue it has is that the hawk looks somewhat like a chicken, due to the rendering of the space below the eye and the small lower beak. In addition, the filled in eye treatment deprives the viewer of a key visual clue. My revision of the logo seeks to fix those issues, first by creating an iris and pupil within the eye, giving it more of a hawk-like appearance. I also made the lower beak larger and added a nostril in the top beak, in the interest of being anatomically correct. The shape under the eye was sharpened, as was the curves at the back of the head. The overall result transforms the team's image from 70s chicken to modern hawk. My next step involved creating wordmarks and uniform numbers that were original, yet evoked the proud, tough heritage of Hawkeyes football. I developed the typography from the Green Bay Packers uniform numbers, tweaking the size of the corners, and developing letterforms from the revised numerals. After the typography was created, I went to work on the uniforms. Iowa's current football uniforms are essentially knockoffs of the Pittsburgh Steelers, except that the Steelers changed their numbers in the 90s. As the story goes, Hayden Frye wanted to give the team the look of a winner to rejuvenate the program. 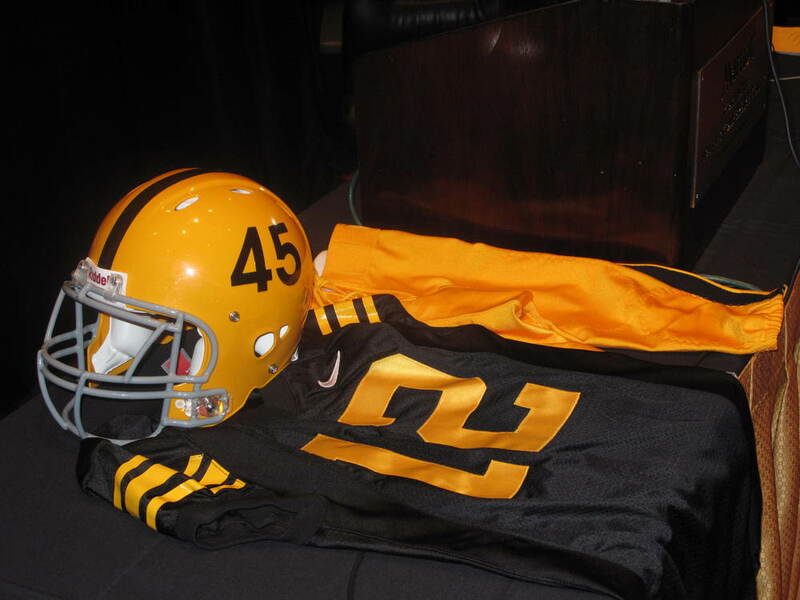 And with the Steelers winning four Super Bowls in the 70s, not to mention that they shared a color scheme with the Hawkeyes, Frye contacted the Pittsburgh club and got approval to use the uniforms. Since the Hawkeyes have no problem winning games nowadays, it's time for the program to forge its own identity. I utilized a two-stripe pattern throughout the scheme, from the helmets down to the socks. 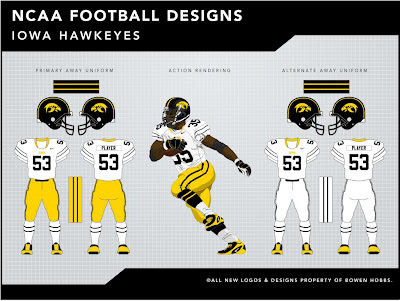 I have also added options for the team to wear white pants and/or yellow jerseys. Lastly I developed a fauxback based on the uniforms the team wore last weekend. 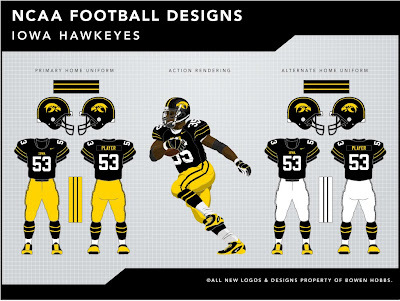 My version streamlines the uniforms by using only one number font, two striping patterns, and a black facemask. 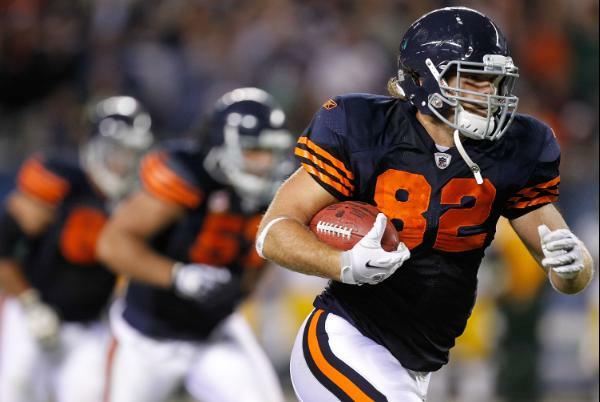 Feel free to leave a comment about football uniforms with side panel designs, the concept above, or anything sports branding related.